Featured: Homes being built on the west side of 1400 block of Brickell Avenue. The featured photograph was taken from the east side of todays 1400 block of Brickell Avenue. The land in the foreground is just east of Brickell Avenue and was part of the Point View subdivision built by Locke T. Highleyman and G.F. Cook. Not easily discernable in the picture is Brickell Avenue. The street was located just to the east (front), of the retaining wall. The homes being built above the retaining wall were completed and occupied by 1915, so the picture was probably taken in 1914. 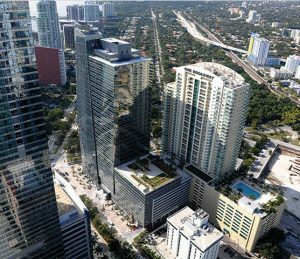 Directly across from Point View, on the west side of Brickell Avenue, the land was naturally elevated on a small Eolithic limestone ridge. The retaining wall provided an aesthetic and supportive structure for the lots built on the top of the natural ridge. The homes were occupied by early Miami Pioneers. The white, one story home in the foreground belong to the Clifford family. William Clifford was from England and was retired when he had the home built. He named the residence “Netherby”. William and his wife only lived in the home from 1915 – 1918 before moving to Hendersonville, North Carolina. 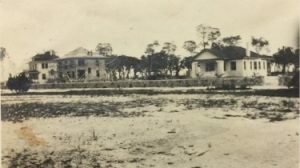 Captain James F. Jaudon lived in the two story home under construction in the middle of the photograph. Jaudon was president of the Chevelier Corporation and was instrumental for the building of the Tamiami Trail. Jaudon was involved with many projects in early Miami. The two story home in the distance was the residence of Freeman Burdine. Freeman was the son of William and the brother to Roddy Burdine. He was a prominent attorney in Miami until his sudden death in November of 1929. Freeman was only forty three years old at the time of his death. His home resided at the northwest corner of today’s Fifteenth Road and Brickell Avenue. Some of the homes seen in the featured photo stood as late as the early 2000s. There was a mid-rise commercial building that replaced the Burdine home, but some of the other homes were still standing prior to the residential and commercial building booms of the last fifteen plus years. Figure 1: 1450 Brickell building that was completed in 2010. Much of the property that comprises the land in the photo is now occupied by the 1450 Brickell Building. This building was completed in 2010 and is the first LEED Gold Class A office tower built in Miami. The thirty four story office tower incorporated the strongest curtainwall window system of any commercial building in the nation. The curtainwall system is designed for large missile impact (hurricane resistance), from bottom to top. The building is not only environmentally sustainable, but should be well protected for most hurricane seasons. It appears that the Eolithic Limestone ridge was graded to street level before the building was erected. The natural ridge may have presented an impediment to building a tall commercial tower, but it likely served the residential homes well by providing high ground during the many major tropical storms of the twentieth century. Featured: Homes being built on the west side of 1400 block of Brickell Avenue. Courtesy of HistoryMiami as part of the Daly Highleyman collection.